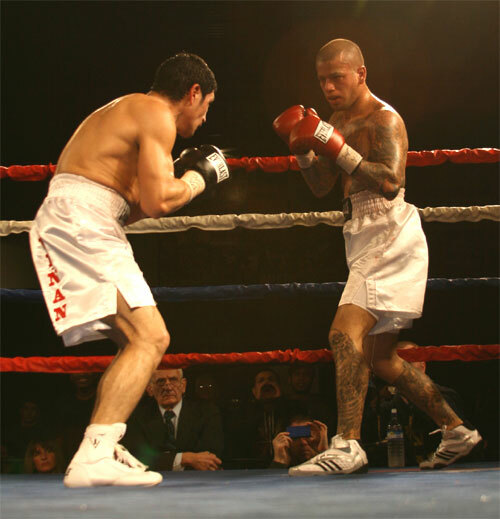 Newark, NJ lightweight Carlos Vinan came to town Friday night and served an upset to local ring favorite Victor Vasquez in their 6-round main event at the South Philly Arena. The bout was a well matched and well fought skirmish, with both fighters having their moments. But Vinan managed to out-work the always busy Vasquez to take the split decision in a fight offered up as the main event. The rest of the show was a collection of seven 4-rounders. Three fighters made their pro debut on the card, including touted amateur Kareem Cooley, now a part of the impressive - and expanding - Doc Nowicki / Jimmy Williams stable. 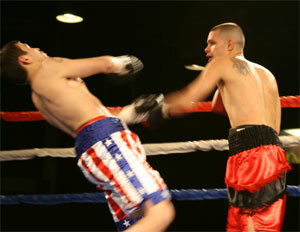 Cooley cruised to a 3rd-round TKO victory just before the main event. Matchmaking was not the issue on this evening. Most of the bouts were competitive and close scraps. But this slate of preliminary bouts were desperately in search of a true main event and the basic structure of a real fight card. When a gang of bouts such as these are stacked together and served up as a boxing show, the results leave the spectator a bit wanting. The evening progresses like a long road trip to a new unfamiliar place. You find yourself in your seat, on a long empty highway looking for your exit. You need landmarks on a long trip, but a volley of four round fights, one after another, provide no such milestones. You just keep driving, nervously waiting to see your exit sign. Friday night's card was like that. The bouts blended together, round after round. Sixteen fighters did their thing. A few highlights jump out, but most of it was one long road trip. Making it worse, this local boxing show had ticket prices scaled from $125 to $40. The economics of the local fight scene don't seem to allow it, but Friday's show should have cost somewhere around $25 or $30. Now I was admitted on a press pass (hopefully not my last with this promoter, given my comments). I hate to bite the hand that admits me, but I heard from many potential fans who said that given the lineup and the prices, they wouldn't be coming. I always think that's a mistake. You never know what you might miss - and once these fights are over, you won't catch them on tape. So I never advocate missing a show. But you probably could have let this one pass. However, despite an early empty house, the crowd eventually filed in and provided a nice first box office take for NJ promoter Andre Kut's KEA Boxing, in his inaugural visit to Philadelphia. You never know if these shows make money, but I estimate about 850 people came to the show. As I said before, matchmaking was not the problem. So let's move forward with the results and ring action. 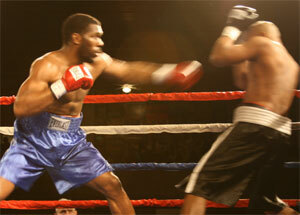 The night began with a heavyweight bout between debuting Bryant Jennings and Zeferino Albino, both of Philadelphia. Jennings made his debut a successful one with a shutout on the scorecards. He effectively backed Albino up with solid shots. He stalked his prey with a wide-legged crouch that at times came close to genuflection. The end of the fight featured many lively exchanges, with Albino going for broke knowing that the judges wouldn't have any good news for him. He gave it a shot, but Jennings, now 1-0, had things under control. All three judges scored it 40-36. Abino went home 3-10-2. Next up, Anthony Yoder of Vineland, NJ, made his professional debut with a unanimous decision over West Virginia's Francisco Portillo. The individual rounds were close. Portillo successfully nailed Yoder a number of times, but fatigue got the better of him and he faded after a round or two. He rallied in the fourth and almost pulled out a draw on my card. But the judges saw it 40-36, 40-36 & 39-37 for Yoder, 1-0. It was Portillo's second straight loss (0-2). 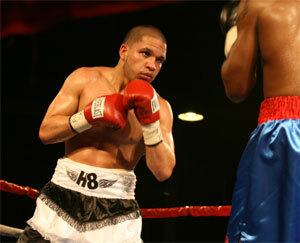 1-0 Philly lightweight, Angel Ocasio made it to 2-0 with his four-round win over Osnel Charles of Atlantic City. Ocasio looked good, dropping Charles in round two and taking most of the exchanges with his better punching power. But Charles, now 1-2, made it difficult. His best round was the third when he staged a rally. The judges saw it 39-37, 39-36 and 39-36, all for Ocasio. 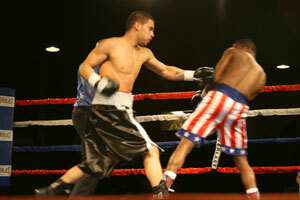 Light-heavyweight Lavarn Harvell, nicknamed "Baby Bowe", efficiently blasted out Ohio's Randy Campbell in a single round. Campbell came out wild, swinging like crazy. But Harvell started landing - quick and hard. A jarring right hand dropped Campbell in his tracks. He got up, but once Harvell trapped him on the ropes, the fight ended. The time was 1:42. 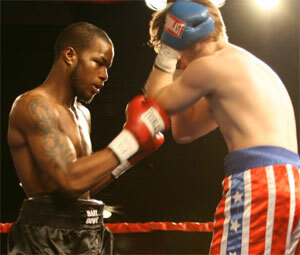 Harvell returned to Atlantic City 5-0 with his second KO. Female lightweights came next. In the weeks leading up to the fight, there was a lot of talk around town about Raritan, NJ's Liz Sherman. Most of the talk was how tough this little chick looked in her training sessions at the South Philly Gym run by her manger/trainer/cut man Joey Eye. She faced Karen Dulin of Mystic, CT on Friday. Seeing them in the ring, you'd never guess they were in the same weight class. Dulin looked like a giant next to Sherman, but Liz was the aggressor throughout. Despite some sloppy ring habits, Sherman won the fight by a smidge with her ability to press the action. She appears to be a future crowd-pleaser, but her raw skills need some refinement. I had her up, 39-38 after four. She and her corner must have been sweating the judges decision, but things worked out for her. All three officials saw it 40-36 for Sherman, who improved to 2-0. Dulin fell to 1-5. Welterweight Juan Rodriguez, Union City, NJ, raised his record to a perfect 2-0 in his slugfest with Dontre King of Maryland. It was a well-waged brawl with King hitting the canvas in the third. But he fought back especially in the last round. 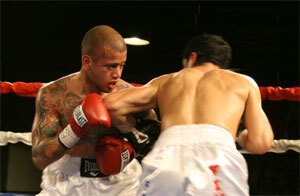 The final moments were great with King leading with a hard right and Rodriguez answering with strong left hooks. Juan had the advantage in the entertaining punch-out. The judges all voted for him 40-35. 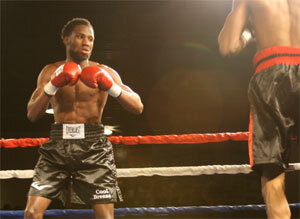 Philly amateur standout Kareem Cooley debuted next against one-fight vet Sidell Blocker. Cooley cruised through the first two rounds before dropping his foe in the third. Blocker returned to his feet with a clumsy back flip, but he had little else to offer. the bout ended moments later when ref Eddie Cotton waved the fight off at 1:12. 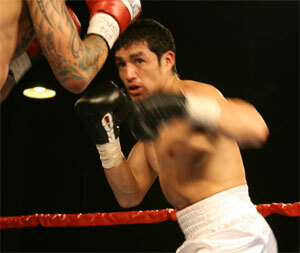 The night ended with the Carlos Vinan - Victor Vasquez fight. All six rounds were fought at very close range, and Vinan did a good job out-working Vasquez. Not an easy task. Vinan, the Newark, NJ junior lightweight, Vinan, was especially effective in the clinches when he repeatedly punished Vasquez with sneaky little shots to the head and body. Vasquez of North Philly, who usually fight a little heavier, took the first two rounds. But he seemed to lose a little steam after that. It wasn't clear if it was the decreased weight or Vinan's punches that was responsible. Vinan began to roll in the third round. The fourth was close with Vasquez staging a nice rally at the end of the round. However it was not enough to take it. The brawling and clinching continued to the final bell. It was a difficult fight to score. There was nothing big that separated the two, except Vinan's edge in work rate. The scores of the judges were all over the place. One had it for Vasquez 40-36 - a shutout. That verdict was overruled by ballots reading 59-55 & 58-56 for Vinan. I had it 58-57 for Vinan. It was just one of those fights. Vasquez had an off night, but he is still the big crowd-pleaser. His record stepped back to 11-4 with 6 KOs. Vinan broke .500 and went to 9-8-3 with 1 KO. New Jersey Hall of Fame chairman Henry Hascup was the ring announcer.